The Dayton area has a long history in paddle sports due to our bountiful network of rivers and streams. Five Rivers MetroParks is working on ways to facilitate paddle-sport recreation in the area, including new facilities and a plethora of programs for beginners to advanced canoe and kayak enthusiasts. Click here for more information on paddling. Ride the River Rentals, located next to the concessions and bike hub at RiverScape MetroPark, 237 E. Monument Ave., hosts kayak rentals provided by local paddle sport retailer Whitewater Warehouse. Beginners are invited to participate in float dates, as well. 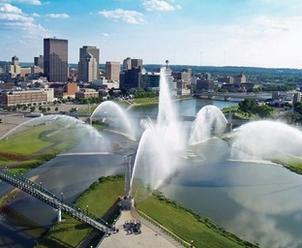 The thrilling new Dayton River Run, located on the Great Miami River in downtown Dayton, opened in May, 2017. Kayakers can enjoy "riding the waves" and performing tricks on this exciting new water feature. Kayaking is a great way to enjoy one of our region’s best features—our extensive network of water trails,” says Five Rivers MetroParks Outdoor Connections Director Greg Brumitt. 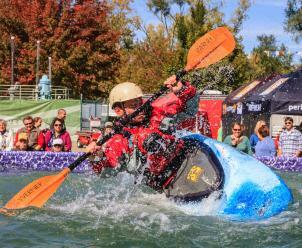 “As we develop the next phase of RiverScape MetroPark, the paddle sport opportunities will improve. The Miami Valley boasts a total of more than 250 miles of water trails that residents can enjoy through paddling, fishing, birdwatching and more! Visit the Ride the River Rentals website for details. Information about Whitewater Warehouse and their products and programs can be found online at their website. Other rentals include roller blades, coaster bikes, tandem bikes, and child trailers, seats and trail-a-bikes. 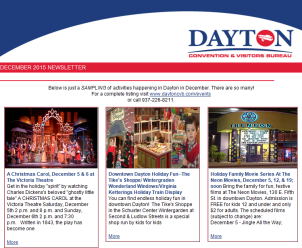 The Greater Dayton Rowing Association has partnered with other area agencies to create the Dayton Regional Rowing Community Olympic Development Program. Given the unique rivers and water features in the Miami Valley, we are poised to help to create a new generation of Olympic-caliber rowers. From beginner level to world-class athlete, the Greater Dayton Rowing Association has something to offer all skill levels. Curious? Enjoy this short video provided by the GDRA.